There are a lot of discussions in my country about tax exemptions that some big corporations can have, in order to maintain jobs in France for Total, L’Oreal and whatever else. Even though the proportion of employees living abroad might be significant in some cases, whatever. In the US, this is the story: this Win America lobby, with Tech titans like Google, Cisco, Apple, Oracle wants a tax break (From 35% to 5.25%) on foreign profits they return (“repatriate”) and create millions of jobs. “We have the choice: bring the money home”. French Government: bad defense. US Corporations: probably a good attack. This makes all the difference between the 2 countries. Jobs in those companies are mostly “at home” . Where are they in France? Nuclear industry probably?! As we use to say in France, “la meilleure défense, c’est l’attaque”. I think you got it. Crisis is a fight. 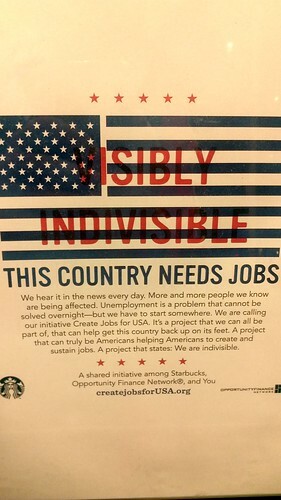 Visibly indivisible, a photo by Philjeudy on Flickr. They are looking to hire for their mobile group. • You know what it takes to ship and appreciate the importance of ‘time to market’. • Distill product requirements into design and technical specifications. If interested or would like more information please contact me, I will give all details. I have been attending to a great Conference from O’Reilly Team Where2.0 in Santa Clara, and I have a lot of content to work on, which I will publish next week on ServicesMobiles.fr, main French website dedicated to the mobile Industry. Posted by Phil Jeudy in iPhone, Jobs, Silicon Valley, Web. Netflix is looking for a very senior iOS engineer who is excited to work on one of the top 10 free apps in the App Store. You will be part of an amazing team of engineers and immersed in an environment that is fast paced, dynamic, challenging, and very fulfilling. More on the position here. No, it’s not a joke. A Bit Lucky is a Company. The new generation of transplatform online social gaming. Zynga has inspired many guys in gaming area, and Frederic Descamps is one of them. Yes, French people are good in gaming Business. Although he has a Stanford diploma, Frederic had a French education. Infogrammes yesterday, Ubisoft today, Gameloft in mobile gaming, French touch is not a legend, it’s a fact. A Bit Lucky has raised $5 million in new funding from South Korean gaming company Nexon. So it’s all good for a while. So A Bit Lucky is recruiting a product manager to lead the Product Management and Analytics Team. As the founding member of our Product Management function, your position will be highly visible and vital to the company’s success. You will work in a central role between the Development and the Publishing Teams to manage P&L across all our games. Your main responsibility will be to improve and maximize the key performance indicators of our games, including virality, on-boarding, retention, conversion and monetization. You will be responsible for defining a detailed product and features roadmap to achieve higher performance for user management and revenues. A great part of the job entails working directly with our game designers at prototyping, content design and feature development with a metrics-driven mentality. Your work will be seen across all of Facebook, other social networks and mobile platforms. Relocation is available for exceptional candidates. Principals only, please.